On to day 10 of Soup Month 2012! Although some soups gets their luxurious smooth texture and deep flavors from cooking for several hours, sometimes you need a hearty bowl of warm soup in a hurry. 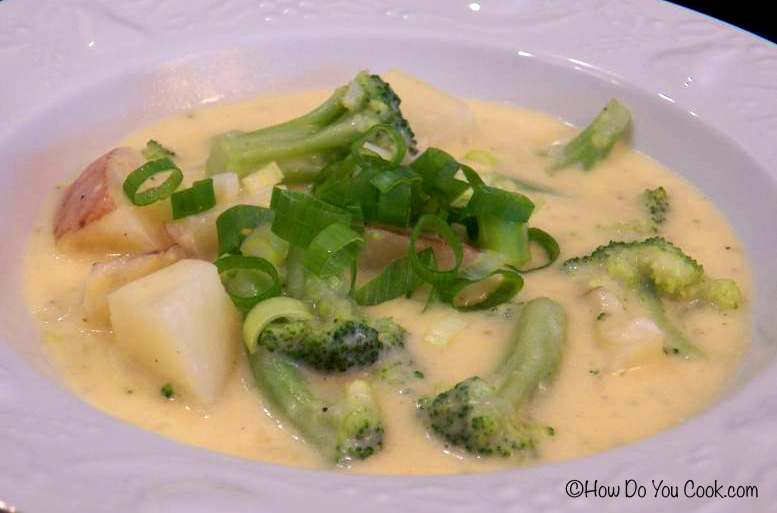 And that's where this Cheesy Broccoli Potato Chowder comes in, just perfect for a cold snowy night. You can make this velvety soup and have it on the dinner table within about 40 minutes. This was a fun soup to serve because each person can choose their topping of choice, or choose no toppings at all. 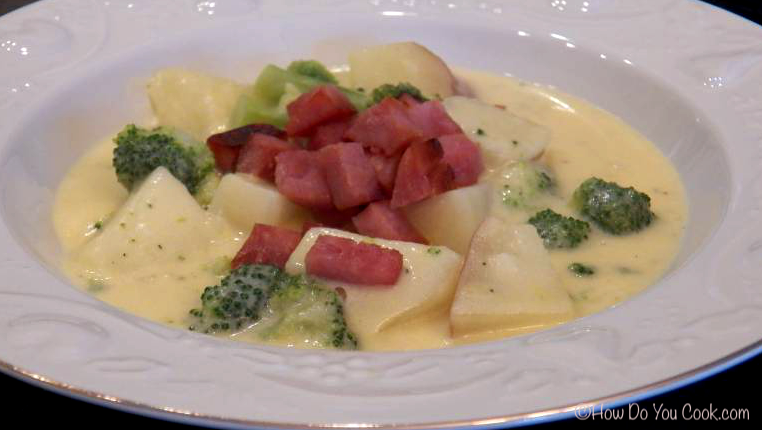 This soup is also a great way to get kids to like eating broccoli, and being able to adjust the garnish to suit their own tastes will make them enjoy the soup even more. Don't be surprised if your picky eater asks for a second bowl of soup! Cook potatoes in a large soup pot with enough water to cover. Bring potatoes to a boil, reduce heat and cover, then simmer for 10 minutes or until potatoes are just tender. Drain potatoes reserving 1 cup. Return remaining potatoes to the pot. In a small bowl, mash the 1 cup of potatoes with a fork, then add the bowl of potatoes to the pot. Stir in the chicken broth, salt and pepper and heat to boiling. Add the broccoli and return to boiling, then cook uncovered for 5 minutes, stirring occasionally. Reduce heat to medium-low. In a small bowl combine the half and half and flour and whisk to fully blend. Add this mixture to the potatoes, stir and continue to cook over medium heat until the soup thickens and begins to slightly boil. Stir in the cheese until completely melted, then stir in the sour cream. 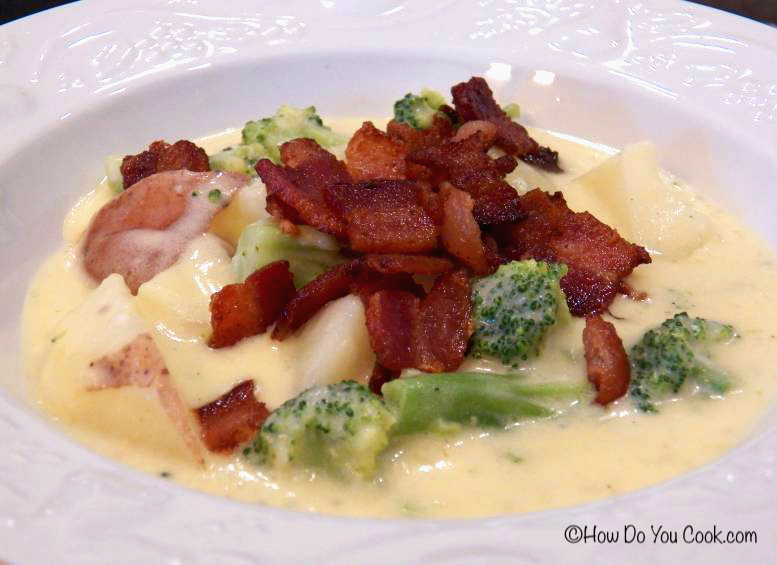 Serve with cooked and crumbled bacon, warm diced warm and chopped green onions. Makes 8 servings and delicious leftovers!